Phage is far from perfect. It is very far from perfect. However, there’s something rather endearing about this cheesy B-movie throwback written by Brannon Braga from a pitch by Timothy DeHass and first draft by Skye Dent. 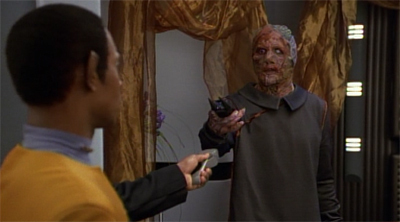 The Vidiians are probably the most memorably and effective aliens from the first three seasons of Star Trek: Voyager, feeling like they could have wandered into the show from some trashy late-night horror movie on another channel. There’s a pulpy quality to the episode that makes it more enjoyable than many of the surrounding Voyager episodes, albeit one undermined by some of the more awkward resonances in the script. Of course, all of the problems we’ve noted about the show so far are still in play. There’s no sense of over-arching continuity. There’s no real sense that this is a crew fused together from two sources operating on the far side of the galaxy. Embarking on a seventy-year journey through alien territory should be a strange and unsettling experience, particularly for a ship intended for a short-range recovery mission. Like every other episode of the first season, Phage seems more like a pleasure cruise than a desperate journey. Sure, there are references to scarcity and rationing. “We’re on our way to a rogue planetoid which Mister Neelix tells us is an extremely rich source of raw dilithium,” the opening log tells us. “If he’s right, this could go a long way toward easing our power shortage.” Of course, there’s never been any indication that the ship has a power shortage, whether before or afterwards. All the lights are on at full blast. All the repairs from the mess made in Caretaker have been completed leaving the ship itself in mint condition. Save a few references to replicator rations, there’s no indication that Voyager is in desperate need of fuel. The ship can engage in a high-speed pursuit of the alien ship without worrying about the use of resources. Phasers are still used casually and as standard. Transporters are used freely, rather than shuttle craft or landing manoeuvres. Of course, it might be easy enough to justify all these choices, but they don’t even get the hand-wave excuse that we got regarding the holodeck in Parallax. Similarly, there are a few token lines about the sorts of changes that will need to be made to the ship to make Voyager sustainable over a seventy-year journey. Discussing the possibility of finding raw dilithium, Janeway reflects, “Assuming we do find dilithium on this planetoid, we’re going to need a refining facility on the ship to process it.” Apparently Torres has already figured out how to convert one set we’ll never see into another set we’ll never see. However, there’s no indication of how this might affect the ship. Will Torres need to take raw materials from elsewhere? Will there be any changes to any part of the ship we might see? How many takes do you think it took to get the line “his lungs have been removed” delivered seriously? The answer is, of course, no. The one change that has been made – Neelix converting Janeway’s private dining room into a galley – took place on a set that we’d never had a chance to explore before. So it doesn’t feel like a change that has been made to an existing room to account for the changing nature of the journey, as much as the début of something that was always going to be there. We never saw that room as anything else, so there’s nothing weird about seeing it converted to a galley. Speaking of which, Neelix is cooking using food from Kes’ hydroponics bay. The concept was only mentioned two episodes earlier, in Parallax. How long has the ship been in the Delta Quadrant? It really seems like everybody has settled into a “business as usual” mindset and adapted to the status quo. Which is a shame, because Voyager has effectively forsaken some of the most interesting stories inherent in the premise. It turns out adapting to life on the other side of the galaxy is not too hard at all. Can you smell what Neelix is cooking? Even the episode’s basic plot beats are the kind of thing that should have long-term repercussions. Of course, this being Voyager, they don’t. 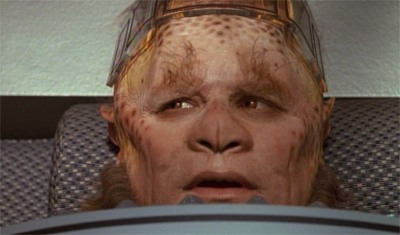 Neelix is sent on an away mission, despite not being a qualified Starfleet officer. He fails to respond to Chakotay’s instructions, repeatedly, and gets himself in trouble. Trying to save his life endangers the whole ship. You would imagine that Neelix would not be allowed on any further away missions, or that there may be an effort to train him as an enlisted officer. Neither happens. Eventually there are some off-handed references to rudimentary training, but nothing that makes a difference. Similarly, the episode ends with Janeway releasing a bunch of organ-harvesting thugs upon the Delta Quadrant with a warning not to do it to Voyager again. “If we were closer to home I would lock you up and turn you over to my authorities for trial, but I don’t even have that ability here, and I am not prepared to carry you forever in our brig,” she explains. 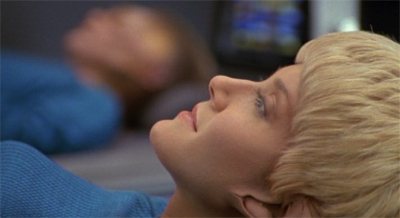 “So I see no other alternative but to let you go.” The logic is hardly convincing – Voyager could easily hold two prisoners for an extended period of time. And, while they were holding these two prisoners, they would not be victimising innocent travellers. Of course, that would require some form of serialised story-telling. An occasional reference to the Vidiians in the brig. Maybe a story in a year or two featuring the duo redeeming themselves, or somebody seeking custody of them, or even their death. That’s more of a storytelling commitment than Voyager is willing to take on, so Janeway decides to let them go. It seems like a decision that isn’t reached for any logical internal reason, but simply because it’s the easiest decision for the show. More than that, though, it marks Janeway as ruthlessly self-interested. She doesn’t seem too bothered that Dereth and Motura are likely to go back to preying on innocent victims as soon as Voyager has left the sector. Although it’s not made explicit in the episode, Dereth and Motura are ruthlessly cynical. They seem to have set the dilithium readings to lure in potential travellers and to prepare them for harvesting. The larger asteroid allows them to disable and immobilise larger ships with more people on them. As sad as Motura’s story might be, these are predators. This presents a view of Janeway’s morality that is ruthlessly at odds with the vision proposed in Caretaker. In Caretaker, Janeway suggested that it was impossible to remain removed from the suffering of innocents. That’s the whole reason that Voyager destroyed the array and trapped itself in the Delta Quadrant. Allowing predators like Dereth and Motura to go free because it’s easiest for Voyager is directly contrary to the entire point of Caretaker. It’s also decidedly self-interested and cynical, at odds with the defence of the principle of non-interference made in Time and Again. In Time and Again, it was suggested that Voyager should not meddle in affairs they don’t understand because that could have dire consequences. Here, the moral seems to be that Voyager shouldn’t meddle in other people’s affairs because that’s somebody else’s problem, now. Even the episode’s ending is a massive cop-out. 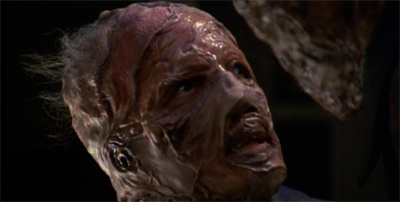 Kex gives Neelix one of her lungs to help save his life. This is grand, but one would assume that halving their breathing capacity would have some form of long-term implications for the duo. (Particularly since Kes’ smaller size means Neelix probably has less than half of his previous breathing capacity.) Unfortunately, like so much else on Voyager, this miracle resolution to the plot is never mentioned again. And yet, despite all these problems, Phage works remarkably well. One thing that is clear about the first season of Voyager is that the show is trying to get back to the classic format and structure of Star Trek. The Delta Quadrant is the Wild West. It has no major political powers yet, even though the Kazon would eventually turn out to be absolutely everywhere. There’s no long-term politicking, just a sense of vast wilderness. I wrote ’em! C’mon, it’s a TV show; it’s supposed to be fun. 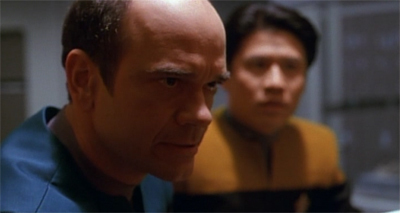 … ‘His lungs have been removed!’ was a fun line that I knew would sound great coming out of Robert Picardo’s mouth. That’s classic Trek. And the episode plays this up. When Dereth is first glimpsed, he’s stalking a corridor wearing a long grey trenchcoat and carrying what looks like surgical bag – the very image of a sinister Nazi doctor from a pulpy thriller. There’s a reason that Sara Wasson’s Gothic Science-Fiction cites Phage as an example of the genre of the same name. And Phage works best played that way. Indeed, the entire plot seems like a Star Trek version of that late eighties/early nineties urban legend about thieves stealing kidneys from unwitting individuals. The visual design of the Vidiians calls to mind Frankenstein’s monster, an organism stitched together from a variety of different sources. Cully Fredricksen plays the organ harvester (and private physician) Dereth with something that sounds like a stereotypically sinister British accent. 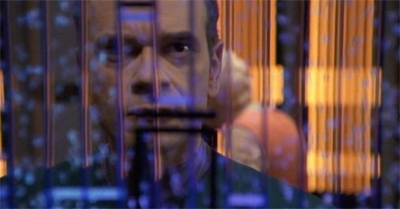 Even the idea of luring Voyager into a hall of mirrors feels like the climax from a deliciously trashy horror. So many enemies to choose from, but which one is the right one? All that’s missing is the sound of Dereth’s cackle echoing inside the asteroid as the Voyager crew face the dilemma. This is very much Brannon Braga channelling his inner B-movie enthusiasm into a Star Trek script, something of a spiritual companion piece to Genesis or Threshold, but working much better than either story. So I started thinking: wouldn’t it be interesting if the bubonic plague in ancient Europe had never ended. What would Europe have become? Well, almost certainly, humans would have persevered, but they might have had to live with the debilitating plague. What if it had continued that way for thousands of years? What kind of culture would exist? That’s basically the Phages. They have been living with a horrible, cellular, chomping Phage through thousands of years, and now their whole culture and technology revolves around pure survival; gathering replacement organs and skin. So they look horrible, but then you talk to them, and you realise that they are incredibly cultural, sophisticated and articulate. This is a nice hook for a story, but it’s hard not look at it in the context of the mid-nineties – when another infectious disease outbreak was weighing on the public consciousness. It’s hard to look at any science-fiction or body horror story in the eighties and nineties without considering how it relates to HIV or AIDS. Despite the fact that the virus was first identified in the early eighties, it only became a major issue with a series of high-profile cases towards the end of that decade and into the nineties. There was a very public concern about the spread of the disease, with a lot of speculation about whether the virus might become airborne. While this concern did help raise awareness of the disease and help to contain its spread, it had some unfortunate side effects. In particular, there was (and still is) a lot of confusion and misunderstanding about the disease and those who suffer from it. Steven J. Sainsbury has described AIDS as “the twentieth-century leprosy”, referring to how those afflicted are treated by others. Showing support for those suffering from the disease is still considered a politically-charged act in some corners. Analogy and metaphor turn into analogue. A disease is not only like the plague, it shares all the characteristics of the plague. A disease is not only like the Black Death, it is the Black Death. Few epidemic diseases are spread by casual contact; Ebola, CJD, yellow fever and cholera, for exmaple, are transmitted by bodily fluids or an exchange of tissue, not by shaking hands. But Americans, who don’t know much about science and medicine, imagine that all epidemics are like the mythic epidemic – highly infectious and usually fatal. That description describes the collective memory of the plague. In Creating icons of AIDS: the media and popular culture, Bronwen Lichenstein makes a compelling case that the media depiction of those suffering from AIDS was directly descended from attitudes expressed towards sufferers of other historical illnesses – a tendency to present them as “others”, external groups and individuals. 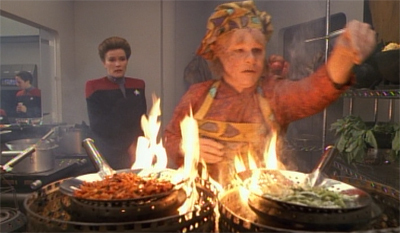 What is Neelix cooking up? Although Braga might not have been thinking of AIDS directly when he wrote the final script for Phage, it’s hard not to read the episode as part of that discourse on the infection – to see Phage as part of a wider pop culture discourse on AIDS and HIV. It doesn’t help that the aliens were renamed at the last minute to something that sounds like “VD-ians”, as if to reinforce the connection between their illness and sexually-transmitted diseases. Even Robert Duncan McNeill seems to allude to this subtext in his Starlog interview, where he describes it as “a very timely episode, for many reasons.” He doesn’t go into any more depth than that, but it seems like a rather pointed summary of the episode in question. As such, there’s a distinctly unpleasant subtext to Phage, which is perhaps appropriate. After all, the cheesy horror and science-fiction movies that it seems to emulate were often steeped in uncomfortable metaphors and imagery. There are other unsettling aspects of Phage. This is really the first episode to focus on Neelix as a character. It’s also the first look that we get at his relationship with Kes. From the outset, the relationship is decidedly creepy. Kes is a three-year-old girl who has never left her world, while Neelix is a seasoned space traveller. 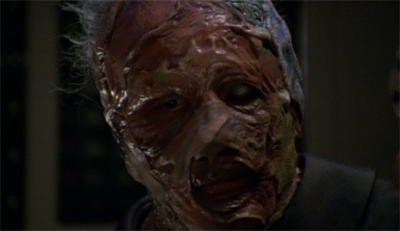 We know that Kes was the victim of physical abuse at the hands of the Kazon before Neelix rescued her in Caretaker. However, it isn’t just these undertones that make the relationship seem creepy and toxic. Here, he’s portrayed as insanely possessive and jealous. He proceeds to insinuate that Kes is possibly cheating on him with Paris. “So it’s Tom now, is it?” he asks, accusingly. “Don’t you see the way that he looks at you?” To be fair, Neelix might be a little right here – given Tom’s attempts to get Harry to cheat on his girlfriend at the start of Time and Again, it would seem Paris has little respect for monogamy. 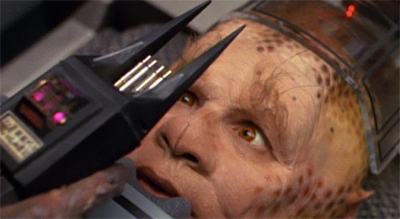 However, it’s the way that Neelix makes these accusations towards Kes that is unsettling. There’s a sense that Neelix wouldn’t dare speak to one of the crew this way, but he can bully Kes because she’s lower down the totem poll. It gets slightly more sinister later in the episode, when it seems like Neelix is very clearly manipulating Kes, a woman with far less life experience than he has, and who has just escaped an abusive trauma. “Kes, I could be in here a very long time,” he offers. “You need to go on with your life. Don’t worry about me.” He adds, “You should just let me die.” It’s a nice sentiment, if sincere. However, in light of the earlier conversation about Paris, it seems like Neelix is just trying to guilt-trip Kes into staying with him by asking her to pull up a seat to the pity party. Worst of all, it seems to work. 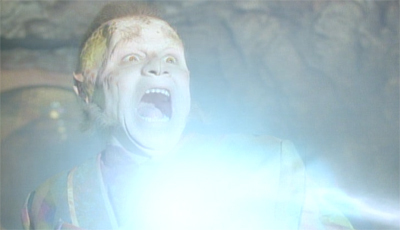 The episode ends with Kes donating a lung to save Neelix’s life. She is eager to do so. “Besides, you’ve done so much for me, let me give you something this once,” she urges him. 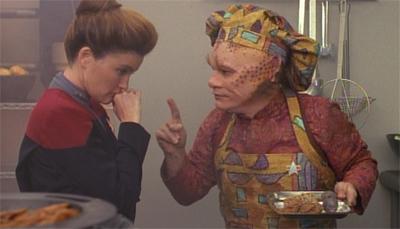 “Just for once.” Again, this is a sentiment that might seem sweet in isolation, but given how possessive and controlling Neelix has been, it seems more like an abusive relationship. After all, despite Kes’ gratitude, Neelix was unable to help her escape from captivity with the Kazon Olga. He only returned when he had something to trade and some substantial back-up. Phage is stronger than many of the surrounding episodes, but it’s still not a great piece of television. 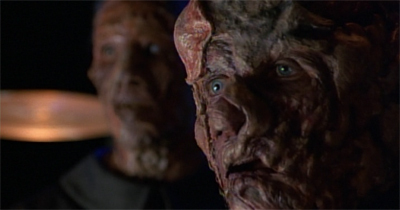 It’s a nice example of Voyager doing gothic horror, and it introduces one of the franchise’s most visually memorable aliens, but it falls prey to many of the problems that dog the season (and the show as a whole), with a rake of uncomfortable (possibly unintentional) subtext. Ordinarily your image captions and obsession with puns are (delightfully) awful, but the WWE reference made me chuckle. So cheers. I know, the puns are terrible, but I hope they diffuse the occasionally pretentious rambling that goes on outside them. I Hope that evrething is ok.
One of David Cronenberg’s favourite themes is body horrors and is especially indicative of his remake of The Fly, when Jeff Goldblum is the victim of biological changes beyond his control after an infusion of insect DNA. Many people construed that as an unconscious (or conscious) metaphor of the AIDS virus which had just begun to emerge into the public consciousness. Personally, I think Cronenberg just wanted to make something icky, at which he succeeded in spades. The Vidiians really did seem to be a missed opportunity. There were very visceral enemies. When the Vidiians try to kill you, it isn’t just to end your life, but take your vital organs, to harvest your most personal parts of you, even your face isn’t safe from their desecration and theft. Being near them evoke a fear similar to that produced by the Borg, in fact, the Vidiians almost seem like a proto-Borg race. They see you merely as a resource to consume. There was a fascinating idea to exploit here. Is this how the Borg got started? Did the Borg turn to cybernetics to combat a disease that ate away at their flesh, and in the process lose their (for a lack of a better term) humanity? One of the more interesting ideas that was never shown, is that there could have been Vidiians who would deliberately seek out the Borg to be assimilated. We have seen members of their species act highly consciously of their appearance, perhaps it would be a fair trade in their minds to give up their individuality so long as their bodies remain intact. Perhaps some Vidiians tire of murdering others for their organs, and the Borg their only escape from the cycle of death. It’s a shame this concept never got developed. It really is. As I think David suggested, the fact that the production team returned to the Vidians in so many flashback episodes (Fury, for example) suggests that they were aware of how poorly they’d chosen with the Kazon in those first two seasons.